Three Arm Yang: The temporal region. Points are ST-8 or GB-13 (depending on the source). Three Arm Yin: Under the axilla. Point is GB-22. Three Leg Yang: Cheek bone. Points are SI-18 or ST-3 (depending on the source). Three Leg Yin: Above the pubic bone. Point is Ren-3. If you are like me, you memorized these points in school, possibly seeing them on the "Big Picture" chart that you diligently memorized in preparation for the boards. Chances are, nobody explained the significance of these, where this information came from, or whether it was even relevant. Why, for instance, is GB-22, a Yang channel point, the muscle meridian meeting point for the three Yin arm sinew channels? To answer these questions, it is important to understand where this information comes from in the first place. These reunion zones or meeting points first appear in a specific translation and commentary of the Lingshu, in Chapter 13, which discusses the sinew channels or Jingjin. I refer to paragraph 13 of this chapter, as translated by Vietnamese scholar Nguyen Van Nghi. "In cases where the Zu Yangming (ST) Jing Jin and the Shou Taiyang ) SI Jing Jin are concomitantly affected, with deviation in the face and eyes accompanied by visual disturbances... the treatment is the same as that which was previously indicated." Leading up to this, paragraphs 1-12 have outlined the topography of the 12 sinew channels along with basic symptoms of dysfunction and treatment. Treatment mostly involves fire needling of ashi points. Van Nghi gives four pages of commentary on this short passage. In it, he defines these reunion zones based on regions (temporal, below the axilla, etc. ), but does not indicate specific points (though images he uses do show points). Looking at the basic topography allows one to see that these pairings of 3 arm and leg Yin and Yang channels would all involve the above reunion zones, as all of these channel end at these sites. Van Nghi further states that, when all of these channels are involved (all of the 3 arm Yang channels, all of the 3 arm Yin channels, etc.) together, then these reunion zones become painful. More specifically, he states that when there is invasion of pathogenic factors in these pairings, then these reunion zones are always painful. I feel an understanding of the underlying anatomy gives some perspective on these regions or points, and can help guide you as to when and if to use them. At the least, the anatomy can help understand how these pairings of channels meet in these regions. Let's take GB-22 or the region under the axilla as an example. Lung sinew channel includes the pectoralis minor and the clavipectoral fascia. The clavipectoral fascia (which envelopes the pectoralis minor muscle), the fascia of the pectoralis major, and the fascia of the serratus anterior all blend together in the region of GB-22. This is seen in the diagram below in the region of the suspensory ligament of the axilla which unites all of these channels and helps form the base of the axilla. 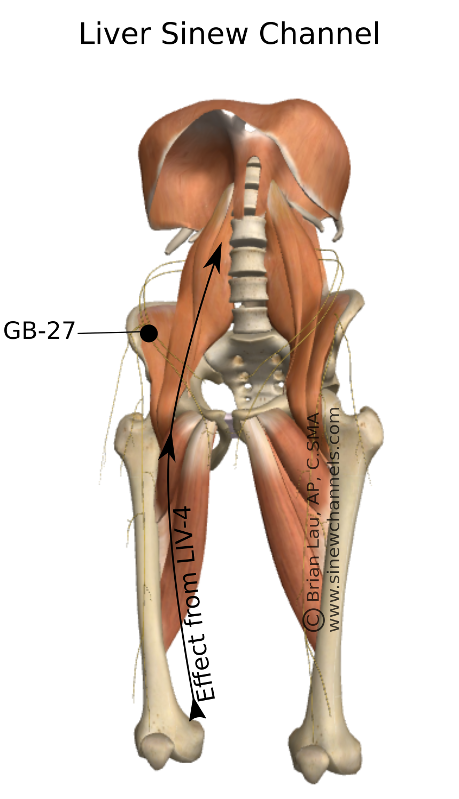 GB-22 is one of several motor points of the serratus anterior (SP-21 is another). It, therefore has a direct influence on this muscle, but I feel that it influences all three muscles and associated channels. Although GB-22 is a Yang channel point, it is a motor point of a Yin sinew channel muscle (Pericardium) and exists at a region where the other Yin arm sinew channels meet. These images highlight the merging of fascial planes of the 3 arm Yin sinew channels. The image on the left is from Netter's Atlas of Human Anatomy. 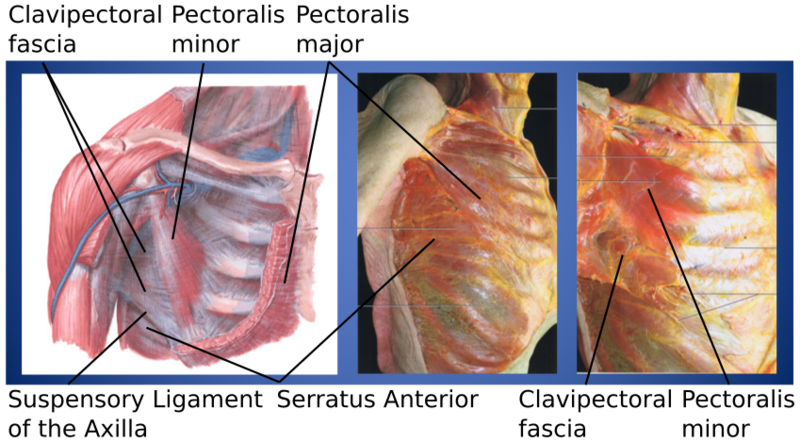 The two images on the right are from Functional Atlas of the Human Fascial System by Carla Stecco. I have not posted in a while and plan on starting up again. Below is a bit of a summary of what I have been doing and some thoughts on future posts. On Saturday, October 29th, Matt Callison and I presented at the Pacific Symposium. 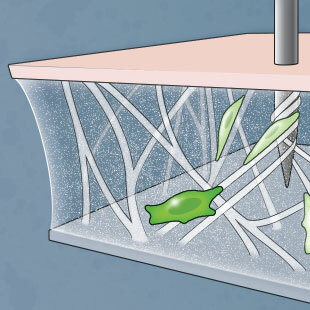 We presented on the work we have been developing on the sinew channels (some of which has been featured on this blog). This presentation covered background on sinew channel study from the Lingshu to the present, and discussed what we are using to further expand this concept. This includes modern functional anatomy, fascial research, ongoing cadaver studies, and clinical observation, among other things. We then explored a few channels (Urinary Bladder sinew channel, Liver sinew channel, Gallbladder sinew channel, Small Intestine sinew channel) and looked at some clinical examples. We performed a few demonstrations on volunteers from the audience for Iliac Crest Syndrome (we referred to this as Yaoyan syndrome, as the pain presents at the extrapoint Yaoyan) and on Levator Scapula Syndrome. In both examples, we looked at the common muscle imbalances and, through the lens of the sinew channels the channel imbalances associated with these pain syndromes individually. These pain syndromes tend to be associated with an elevated ilium (with Yaoyan syndrome) and a elevator scapula (for levator scapula syndrome). 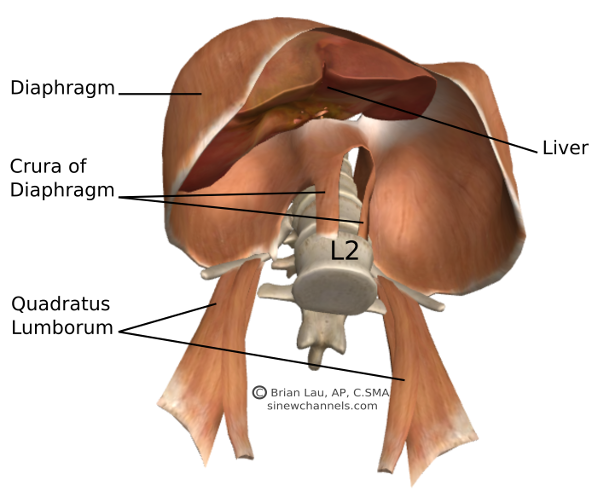 Finally we discussed how these two syndromes are commonly seen together, and specifically how assessment and treatment of the quadratus lumborum (part of the Liver sinew channel, Fig. 1.) and the levator scapula (part of the Small Intestine sinew channel) represents a midday-midnight channel relationship (Fig. 2). Recently (12/1-12/4), I retook a visceral manipulation course through the Barral Institute. I have been interested and influenced by this work for a long time and plan on studying it in earnest this coming year. While this blog focuses on the development of a more anatomically precise model for the sinew channels, I believe that visceral manipulation gives much insight into how the internals relate to the myofascia (how the primary channels nourish and influence the sinew channels). This will be discussed further in a future post. For now, I will share an image of the liver and its relationship to the diaphragm and the quadratus lumborum. Jean-Pierre Barral, the developer of visceral manipulation, feels that excessive energy in the liver disperses into the quadratus lumborum and psoas muscles (Fig. 3). Again, more discussion on this is to come. I recently returned from Chicago for the start of Module 3 of Sports Medicine Acupuncture Certification (SMAC). The beginning of the module involves two classes, two days each. The first class was the Anatomy/Palpation/Cadaver Lab, taught by Matt Callison, David Vavrinchik, and myself. The second was Fascial Release for Myofascial Meridians, a class that I assist with and is taught by Simone Lindner. In October, I will return to assist with two classes for this module, the Assessment and Treatment of Low Back and Hip Injuries and Postural Assessment and Corrective Exercises (PACE) III, taught by Matt Callison and Ian Armstrong. While teaching is an opportunity to share information with the class participants, it is also a chance for learning and investigation. In this past sequence, there were many chances for exploration, but one stood out for me. This involved a 'cross pollination' of ideas from Matt and myself and from Simone. Simone is a longtime instructor with KMI (Kinesis Myofascial Integration), which is the school of structural integration started by Tom Myers, the author of Anatomy Trains: Myofascial Meridians for Manual and Movement Therapists. She is teaching a version of this program as a part of SMAC. But, since all of the participants are acupuncturists, we are able to look at relationships between the fascial release work that they teach for the myofascial meridians and acupuncture techniques that we teach to work with the sinew channels. One such incidence involved working with the iliacus and psoas. Simone was in the part of the class where she was working with imbalance in these extremely important structures. 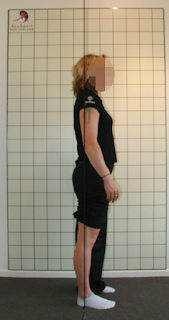 After assessing and before actually performing the techniques, she palpated the iliacus and psoas. She would then perform the techniques and expect to feel the tissue change. But, we decided to try acupuncture first and then see if there was change in the tissue. The main points we used were GB-27 and LIV-4. 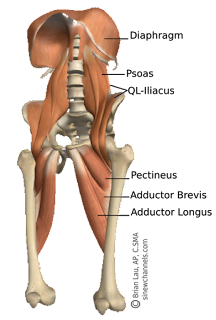 The psoas is a tricky structure to treat directly with an acupuncture needle. You can not reach it through the front without penetrating the peritoneum and there are risks involved with accessing it through the back. Matt Callison teaches a way to treat it with a particular needle technique at GB-27. The needle technique must propagate a sensation to one of three places to be effective in changing the holding pattern of the psoas. Distal points for the psoas could include the Liver channel, as the psoas is on the Liver sinew channel. Or it could include Kidney points, as the psoas converges with the Kidney sinew channel at the spine. I recommended LIV-4, as the model had an anterior pelvic tilt on the side being worked on and a posterior pelvic tilt on the opposite side. In this type of situation, LIV-4 can be part of the treatment for the side with the anterior tilt. This is part of a protocol we teach in SMAC for an asymmetrical pelvis. I feel that LIV-4 addresses the shortened tissue along the sinew channel coming up the medial thigh and into the the iliacus and psoas. After needling these points, obtaining the proper Deqi sensation, and with very little retention (we would have retained longer if time had allowed), we removed the needles and had Simone reassess. She was surprised by the degree of change that occurred in the tissue from this technique. After this, her technique required much less work. This is a very good argument for performing needling first and manual therapy second, as the acupuncture can do so much to open and prepare the tissue. There is a role of the 'fuzz', these web-like fascial connections between sliding planes of tissue such as muscles. 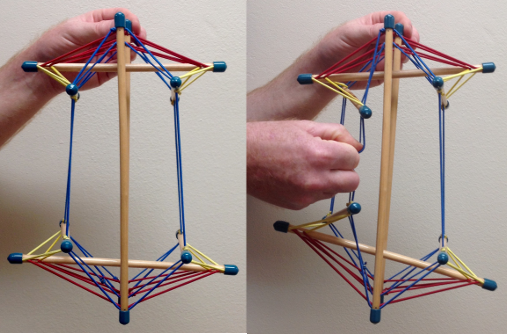 Current understanding indicates that these fascial interconnections are important for proprioception. 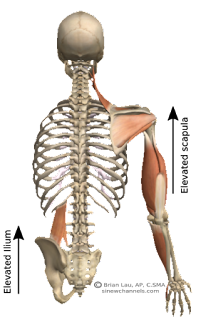 They help link the muscular system with the nervous system and assist with coordinating complex and efficient movement patterns. So, the 'fuzz' is not bad or pathological, and Gil Hedley was not trying to indicate that it is. But it can become too densified and restrictive (for reasons described in the video). And this can disrupt the proprioceptive role of these fascial attachments, leading to inefficient movement, reduced range of motion, and pain. the paragraph to the left. In Sports Medicine Acupuncture Certification, we have the opportunity to work with fresh tissue cadavers. It is very interesting to take an acupuncture needle, especially a good quality Chinese needle like a Hwa-To, place it in this fuzz, and rotate it back and forth. This really highlights the adhesive quality of this tissue; it is fascinating to see how quickly it adheres to and wraps around the needle (Fig. 1). This tensions and stretches the fascia and can help explain much of the therapeutic benefits of acupuncture as has been so clearly described by fascial researcher, Helene Langevin (click here to read a great summary of her research). When doing dissection, many times you are cutting through this fuzz as you separate one structure from the next. This is frequently how you navigate through the structures, as the body's compartments are organized through the fascia. Without these cleavage planes, it is often difficult to know exactly where you are (cadaver specimens are not nearly as clear as an illustration). Imagine using a scalpel to separate a section of an orange. If you veer into the pulp, it is easy to get lost. Like the membrane that contains and separates the orange section, this is one of the roles of fascia; it compartmentalizes the body. A colleague that studied with another fascial anatomist, Todd Garcia, quoted him as saying 'the truth is in the bucket'. Meaning, in dissection, you are often cutting away this tissue, which contains so much proprioceptive information and is increasingly understood to have so much function, and discarding it. You do this to get to the 'good stuff'. Or, at least, to see the units of the body and better understand its organization. But, in doing so, much of the tissue which can explain the mechanism through which holistic practices such as acupuncture and myofascial release work is discarded. This image (Fig. 1) is from the excellent book, Functional Atlas of the Human Fascial System, by Carla Stecco. In Manhattan two years ago, during the Sports Medicine Acupuncture Certification (SMAC) program, Matt Callison and I were preparing a fresh tissue cadaver specimen for the Anatomy/Palpation/Cadaver lab for Module 3, which addresses the lower back and hip. In this specimen, we observed an interesting fascial expansion which extended from the deep fibers of the gluteus maximus and connected to the hamstrings and sacrotuberous ligament (STL). This was in the region of BL-36. We saw this as confirmation that the gluteus maximus was part of the Urinary Bladder sinew channel. 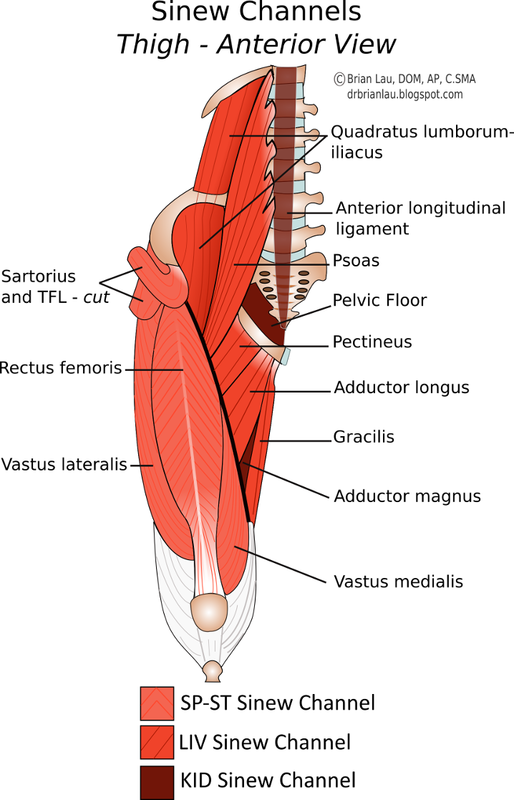 Maybe this seems like an obvious sinew channel in which to place this muscle, but consider that the gluteus maximus also attaches to the iliotibial band (ITB) which is on the lateral leg. Also, this muscle matches the topography described in the Lingshu, which mentions that the Gallbladder sinew channel has a branch that attaches to the sacrum (Fig. 2 and 3). Both of these vectors of pull are discussed in Stecco's book and seen in Fig. 1. The black line (ITB - gluteus maximus - sacrum) describes the GB sinew channel. 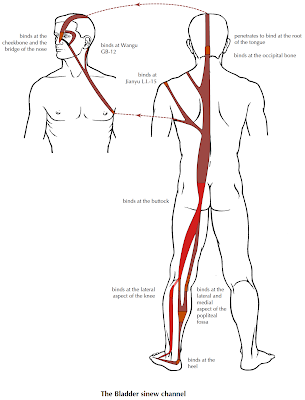 The red line (hamstrings - gluteus maximus - STL - thoracolumbar fascia and erector spinae) describes the BL sinew channel. 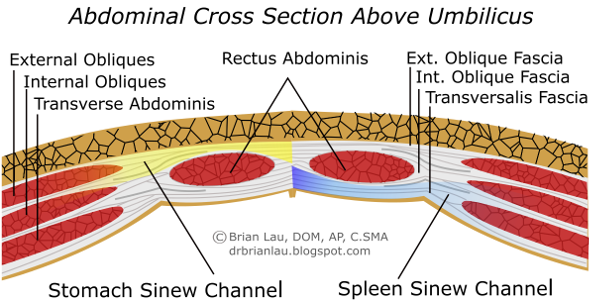 So, the gluteus maximus is an example of where two sinew channels converge. Like the primary channels, this kind of convergence is something that occurs with some regularity. 1) The gluteus maximus MP can be added to treatments that affect the GB sinew channel. These include trochanteric bursitis, iliotibial band friction syndrome, and asymmetrical pelvic tilts (contributing to a host of potential problems). Treatment can include GB distal points. 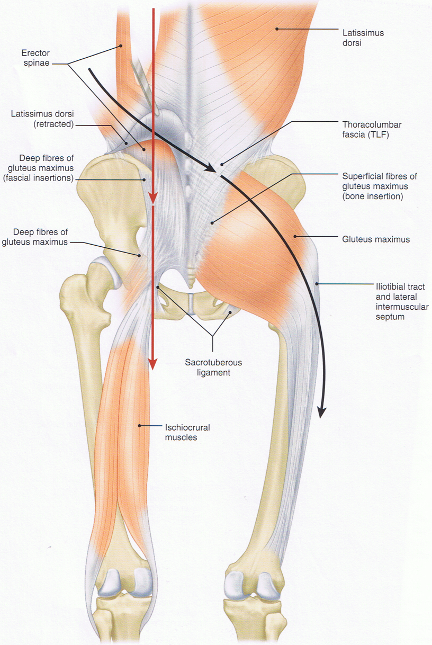 2) The gluteus maximus MP can be added to treatments that affect the BL sinew channel. These include hamstring and gluteus maximus strain, hamstring tendinopathy, coccydynia, sacroiliac joint problems, and erector spinae strain. Treatment can include BL distal points. 3) The gluteus maximus MP has an empirical use, which is that it reduces tension in the upper cervical muscles. This is an example of treating below to affect above on the same channel. 4) The gluteus maximus MP can be considered as a distal point when treating restriction and pain in the pectoralis muscle. The pectoralis major is on the Heart sinew channel, so this can be considered a midday-midnight (GB-HE) treatment. 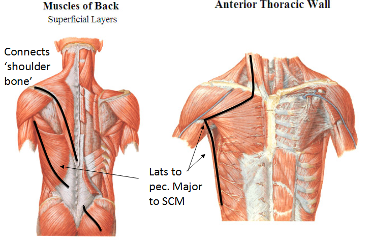 And, there is a branch of the BL sinew channel which also travels through the pectoralis major via the thoracolumbar fascia - latissimus dorsi - pectoralis major - SCM branch seen in Fig 4. It is not imperative that you know which channel relationship you are affecting, and this topic can be taken up another time. 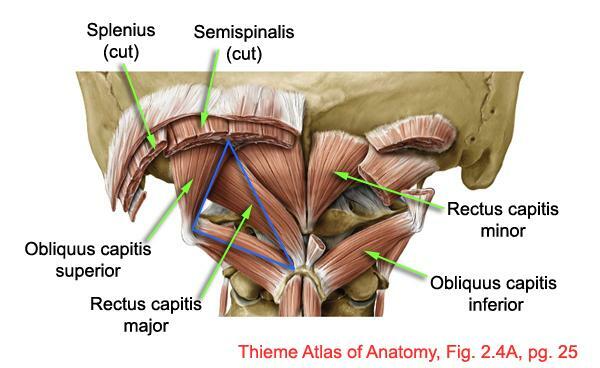 5) Lastly, the gluteus maximus becomes bilaterally weak when there are upper cervical vertebral fixations. This is harder to explain easily; I can refer you to an article I wrote that was in the Illinois Association of Acupuncture and Oriental Medicine Newsletter (The Illinois Acupuncturist) and will be in the upcoming Florida State Oriental Medical Association newsletter. This is also posted on my blog and you can click here to see it. Basically, I see this problem as an interaction of the Urinary Bladder sinew channel and the Spleen and Stomach sinew channels, and an example of Earth overacting on Water. These sinew channels have an agonist/antagonist relationship. The Stomach and Spleen sinew channels become bound, which restricts the anterior portion of the diaphragm and the deep anterior myofascia (abdominals below, transversus thoracic and hyoids above). This causes tension in key regions of the spine and can lead to vertebral fixations. Certain muscles on the BL sinew channel then become bilaterally weak (the gluteus maximus in the case of upper cervical fixations). In Sports Medicine Acupuncture, we treat upper cervical fixations by using vertebral mobilization techniques for the affected vertebrae, needling SP-4/P-6 (which affects the deep holding pattern) and needling the MP of the gluteus maximus. What I would like to consider in this post is the actions of this point on muscle tension headaches, specifically on reducing tension in a group of muscles that often become dysfunctional together as part of this pattern of tension headaches. These muscles individually refer pain to the posterior neck and occiput, the temple region, and the region of the orbit of the eye. Collectively, their referral patterns overlap and can create a composite pattern of pain that many of our patients describe when they come in for treatment. These muscles are the trapezius muscles (primarily the upper fibers but also the lower fibers can contribute to headaches), the suboccipital muscles, the sternocleidomastoid (SCM), and the temporalis muscle. Fig. 1: TrP pain referrals of the upper trapezius, the suboccipital muscles, the SCM (sternal head), the temporalis, and the SCM (clavicular head). Image from Myofascial Pain and Dysfunction: The Trigger Point Manual by Janet Travell and David Simons. 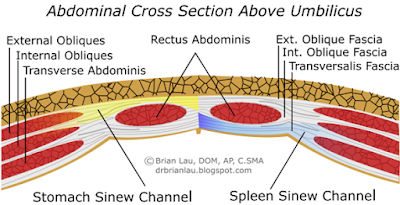 What unifies these muscles from a channel theory perspective is the Urinary Bladder sinew channel. An uprising of Yang, and a flaring of Fire and stirring of Wind, often with disharmony in the Liver network, manifests as contraction in the muscles listed above. These muscles are all part of the Urinary Bladder sinew channel. This channel unites these muscles together in a type of disharmony that causes muscle tension headaches. 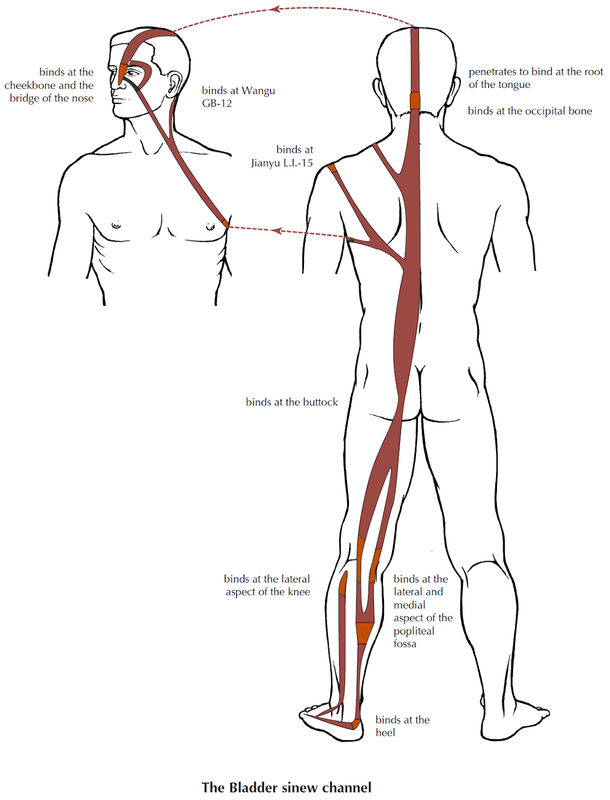 The sinew channel would indeed include the suboccipitals along with the chain of myofascial tissue, creating a myofascial meridian, and rising up the back of the body (Fig. 4). This is an obvious muscle to include in any channel description involving the trajectory of the Urinary Bladder channel. And this myofascial meridian also includes the thoracolumbar fascia, the thick aponeurotic structure in the lumbar region. But, other structures attaching to the thoracolumbar fascia explain several branches of this sinew channel. This includes the latissimus dorsi and the lower fibers of the trapezius (Fig. 3). The latissimus dorsi has obvious fascial connections to the pectoralis major which, in turn, connects with the SCM. The trapezius, accounting for the LI-15 and GB-21 binding regions depicted by Deadman and discussed in the Lingshu, blends in with the fascia of the scalp and connects to the temporalis muscle. Excess Yang rises up and all of these muscles become dysfunctional and contribute to the building pain many people feel throughout the day. It can also contribute to the typical guarding posture that is seen with increased stress which is referred to as upper cross syndrome (a posture with a forward head and protraction of the scapula). Fig. 4: A dissection of the Superficial Back Line from Anatomy Trains. This image includes, from left to right, the plantar fascia, the fascia of the periosteum of the calcaneus, the Achilles tendon, the gastrocnemius and soleus, the hamstrings, the sacrotuberous ligament and posterior sacral ligaments, the erector spinae and suboccipitals, and the galea aponeurotica or the fascia of the skull. This is very similar to the myofascial of the main branch of the the Urinary Bladder sinew channel. This point, frequently combined with SI-3, serves as a great distal point to treat muscle tension headaches. This should be combined with proper needling of the motor points of the involved muscles and with treatment of the root of the disharmony (BL-60 treats the manifestation of Yang rising, so the practitioner should look to the pattern of excess and deficiency present with the patient, also). Many of the motor points of the muscles involved coincide with points that many acupuncturists already use, but the techniques and depth required to reach and affect muscle spindle relationships in the muscles is not always adequately preformed. The motor points are briefly described, but this type of information is best left to a classroom discussion. I will be teaching a foundation course in Sports Medicine Acupuncture for the neck and shoulder in Manhattan and in the Tampa Bay area in the new year (dates to be determined soon). For other classes and for Sports Medicine Acupuncture Certification (SMAC), you can look at the schedule on the SMA website. Upper trapezius – motor point 2 is GB-21; the muscle can be grasped and held away from the rib cage, and it can be needled from SJ-15 with the needle pointed up (away from the pleura) towards GB-21. Motor point 1 is about halfway between SI-15 and -16 and is needled (with the patient supine) through the anterior edge of the muscle from anterior to posterior and with a slightly upward direction. This is through the fibers in the region where the muscle turns from being horizontal to more vertical as it ascends the neck. Suboccipitals – accessed from GB-20. Deadman describes palpation with the finger angled towards the nose (this goes into the suboccipital triangle), the finger angled towards the contralateral eye (this accesses the rectus capitis posterior major), or the finger angled towards Yintang (this angles the needle towards the attachments of muscles such as the trapezius to the occiput). We discuss some other needle angles and depth in Sports Medicine Acupuncture classes, but there are safety issues with the vertebral artery that makes a classroom setting much better for this discussion. SCM – both heads can be needled from ST-9. However, it is imperative that the needle direction is lateral and that the needle ascends through the muscle of the SCM and does not travel medial to the muscle towards the carotid artery. Note: this is a different technique than ST-9 describe in A Manual of Acupuncture which discusses needling between the carotid and the thyroid cartilage. SJ-16, though not a motor point, is another reactive point that affects the clavicular head of the SCM. Palpate for the most reactive region and angle slightly anterior into the muscle. Another motor point to consider is the piriformis motor point. This point is halfway between BL-54 and BL-53. It is an empirical motor point and it eases pain in the BL-10 region (describing the method of treating below to affect above). And it can also reduce tension in the pectoralis minor (a midday-midnight [zi wu liu zhu] relationship) and assist in opening the chest and correcting the typical upper cross syndrome seen). Note: these motor points are listed in Motor Point Index - An Acupuncturist's Guide to Locating and Treating Motor Points. It is worth noting that the sinew channels converge and that many of the muscles discussed are part of other channels and can be addressed via distal points on other channels. The trapezius, for instance, is a muscle where the Large Intestine, Sanjiao, and Gallbladder sinew channels also converge. There are many other instances where you would consider Shaoyang or Yangming point combinations for other type of disharmonies affecting this muscles; points such as GB-39 and LI-10 come to mind. The above discussion was specifically about a series of muscles related to muscle tension headaches and their dysfunction, which can be seen as a disharmony affecting the Urinary Bladder sinew channel. 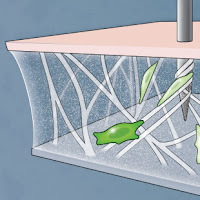 "Jianyu L.I.-15, a meeting point of the Large Intestine channel with the Yang Motility vessel, is also reached by the Lung and Bladder sinew channels, the Large Intestine divergent channel and the Small Intestine luo-connecting channel. Jianyu L.I.-15 is considered the preeminent point for treating the shoulder, and clinically the majority of shoulder disorders affect this region. "1 This is a quote from the commentary of LI 15 in A Manual of Acupuncture by Peter Deadman. There is a lot of information in this opening paragraph; a look at the anatomy will help to elucidate it. "enters the bottom of the armpit"
Interestingly, the supraspinatus muscle is part of the Small Intestine sinew channel and its muscle belly is accessible at SI 12 (which is the motor point of the supraspinatus).3 However, its musculotendinous junction is reached by LI 16 and its humeral attachment is reached from LI 15. The long head of the biceps brachii (part of the Lung sinew channel) lies in the bicipital groove where it is held in place by a ligamentous structure called the transverse humeral ligament. 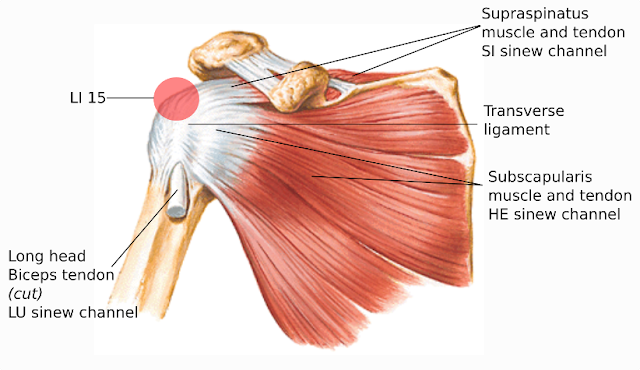 While not described this way in anatomy texts, the transverse ligament is actually a fascia sling composed of the superficial fibers of the subscapularis tendon, a muscle of the Heart sinew channel, and longitudinal fibers of the supraspinatus tendon.4,5 Overactivity in the subscapularis muscle can contribute to pain in the long head of the biceps as the additional tension, transmitted through the transverse ligament, compresses the muscle and its tendon sheath and can be an aggravating factor for bicipital tenosynovitis (inflammation of the tendon sheath of the long head of the biceps). So LI 15 is a fascial meeting point of the supraspinatus (SI sinew channel) and subscapularis (HE sinew channel), and this point is classically described as a meeting point of the Small Intestine luo-connecting channel, a point that would connect the Small Intestine channel with its internally related Heart channel. 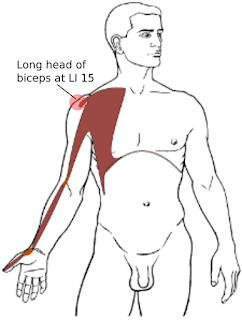 Needling at LI 15 accesses the region where the supraspinatus tendon attaches and where the transverse ligament crossed over the biceps tendon. Therefore this point can be used when there is pain from supraspinatus tendinopathy and/or from bicipital tenosynovitis. 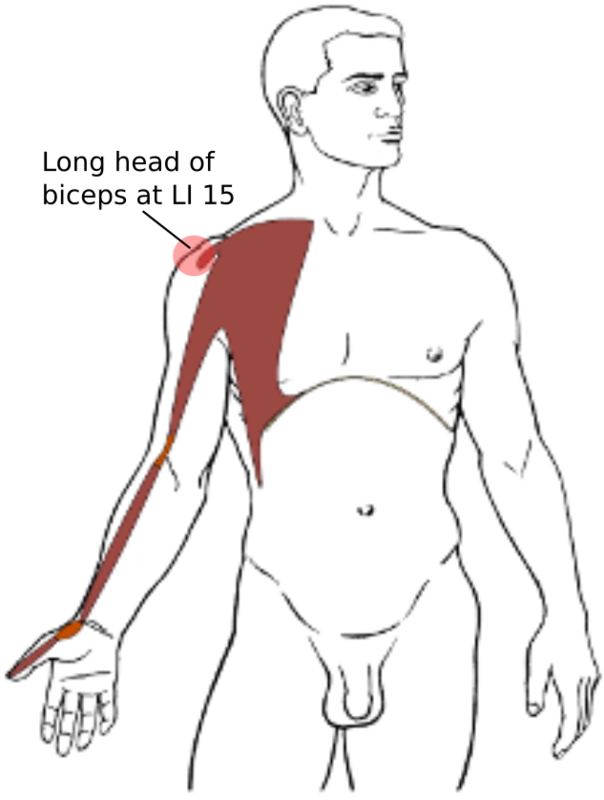 These are two of the most frequent shoulder conditions, so it can be seen why LI 15 is so useful. Which other points are used in addition will be based on which pathology is being treated, which muscles are overactive and which are inhibited, and, based on this, how well the glenohumeral joint is functioning. 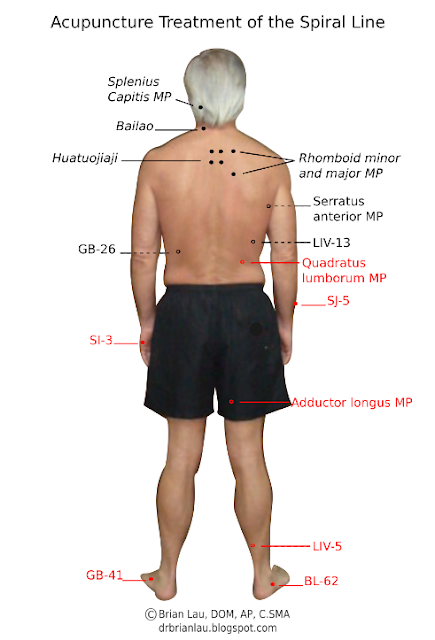 Frequently used points include SI 12 (the motor point of the supraspinatus), SI 11 and the motor points of the infraspinatus, SI 9.5 (the motor point of the teres minor and half way between 9 and 10), and HE 1 (the motor point of the subscapularis).6 There are other direct techniques which can be used for specific conditions. Many practitioners would agree that distal LI channel points are often used for shoulder problems such as supraspinatus tendinopathy and bicipital tenosynovitis. Obviously the LI channel flows through LI 15. But, as mentioned above, LI 16 accesses the myotendinous junction of the supraspinatus and the Large Intestine channel then intersects with SI 12 en route to LI 17. 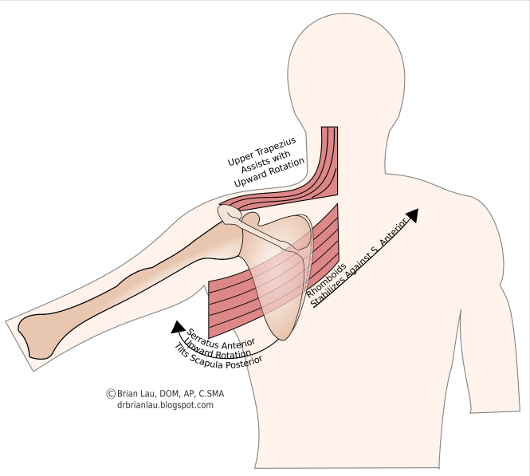 A specific distal point commonly used for shoulder problems is LI 11. This point can be threaded to connect with HE 3 (or vice versa) which would help connect the Large Intestine channel (which intersects with SI 12 and the supraspinatus) with the Heart channel (which connects with the subscapularis) and helps balance the relationship of these to important shoulder joint muscles. 1. Deadman, Peter, Mazin Al-Khafaji, and Kevin Baker. A Manual of Acupuncture. Hove, East Sussex, England: Journal of Chinese Medicine Publications, 2007. Print. 2, Myers, Thomas W. Anatomy Trains: Myofascial Meridians for Manual and Movement Therapists. 3rd ed. Edinburgh: Churchill Livingstone, 2014. Print. 4, Gleason, P.D. 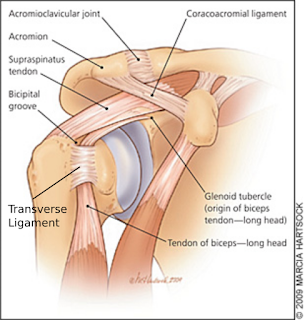 "The Transverse Humeral Ligament: A Separate Anatomical Structure or a Continuation of the Osseus Attachment of the Rotator Cuff?" American Journal of Sports Medicine 34.1 (2005): 72-77. Web. 5, Stecco, Carla, and Warren I. Hammer. Functional Atlas of the Human Fascial System. Edinburgh: Elsevier, 2015. Print. 6. Callison, M. (2007). Motor Point Index: An Acupuncturist's Guide to Locating and Treating Motor Points. San Diego, CA: AcuSport Seminar Series LLC. A common treatment we utilize in Sports Medicine Acupuncture® when there is strain along a sinew channel involves the classical needle technique of multiple needles along a line (pai ci). This treatment can help release bound fascia and restore length and range of motion along this line. This post will discuss an acupuncture treatment for shortening along the upper portion of the spiral line (SPL) discussed in Anatomy Trains; it is a useful protocol for posterior neck pain (often unilateral) when there are shifts and rotations seen between the pelvis, ribcage, and neck. 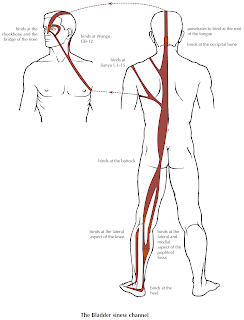 The SPL is a myofascial structure that winds around the body. Posturally, it can be be associated with rotational distortions and shifts of major body structures. Often times, it is involved with more superficial counter rotations to deeper core rotational patterns, such as those caused by having one psoas shorter than the other. First, a word about what the SPL is and how it relates to the sinew channels. The SPL is a myofascial meridian discussed in Thomas Myers' book Anatomy Trains: Myofascial Meridians for Manual and Movement Therapists. There are strong parallels between the sinew channels discussed in Chinese medicine and the Anatomy Trains (myofasical meridians) discussed by Myers. I have used this book, along with other sources, as one of my references as I determine which myofascial (muscles and fascia) structures belong in which channel. This sinew channel information is then taught in the Sports Medicine Acupuncture Certification program (which, for this certification cycle, is in Chicago). While there are points in common, there are also key differences between which structures make up the sinew channels and which are discussed in Anatomy Trains. The spiral line, however, is not similar to any one sinew channel, and can be seen as a unique structure. Actually, it involves the interaction of multiple sinew channels, primarily the Urinary Bladder, Gall Bladder, and Stomach sinew channels. The upper SPL travels from the ASIS of one ilium, crosses to the opposite ribcage, wraps around to the posterior torso and travels under the scapula, and crosses back around to the other side at the spine (on the same side as it started) to connect to the neck. For instance, if we started at the left ASIS, it would incorporate the left internal oblique muscle, the right external oblique to the right serratus anterior, and right rhomboids (see the last post on the rhombo-serratus sling), then crossing over to the left splenius cervicis and splenius capitis to attach at the left transverse processes of C1-C3 and head. There would be a parallel structure on the opposite side of the body starting at the right ASIS and ending on the right C1-C3 transverse processes. 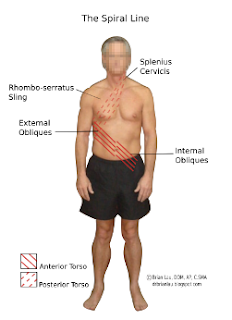 When there is shortness in one SPL, the ASIS will be closer to the contralateral lower ribcage. This will be seen with a ribcage that is shifted left or right in relation to the pelvis (shifted towards the ASIS of the short SPL) and/or rotated in relation to the pelvis (rotated toward the ASIS of the short SPL). This will be caused by shortness in the fascial sling of one internal oblique and the contralateral external oblique and serratus anterior. In addition, the head will then be shifted in the opposite direction in relation to the ribcage and/or there will be lateral flexion of the cervical spine. This will be caused by shortness in the remaining portion of the sling, which includes the serratus anterior and rhomboids (rhombo-serratus sling) and the contralateral splenius cervicis and capitis. Assessment of this involves a visual observation of the patient's posture. Once it is determined which side is short, the following acupuncture protocol can then be added to the treatment. This protocol will release the bound fascia and restore length to the shortened SPL. 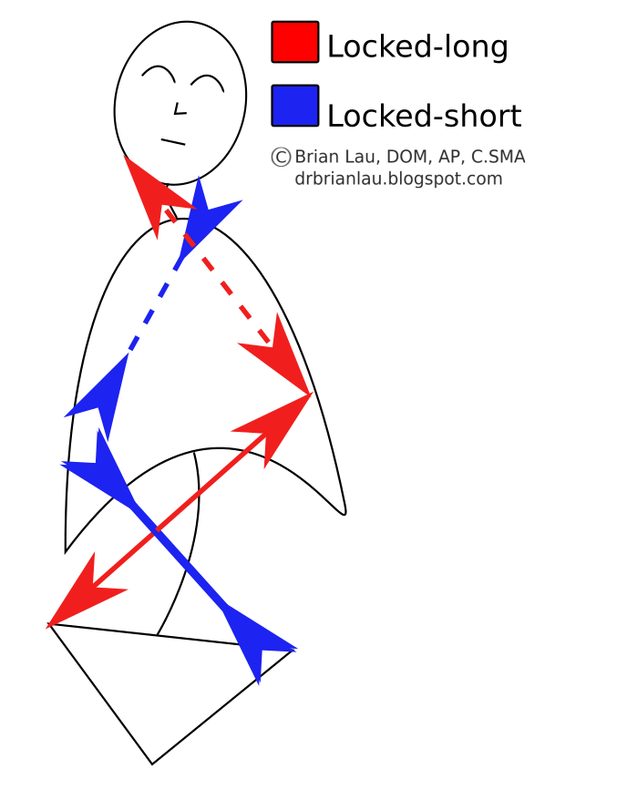 This shortened side will frequently correlate to the side of the neck pain that a patient comes in complaining about, and can include trigger points in the shortened splenius cervicis, trigger points in the levator scapula (which will also often be in a shortened position), facet joint pain on the side of the shortened splenius cervicis (and the side of lateral flexion compressing the cervical facets on that side, and many other cervical complaints. GB-26 (the motor point of the internal obliques) and the contralateral LIV-13 (the motor point of the external obliques). Serratus anterior MP on the same side as LIV-13. Rhomboid major and minor motor points on the same side as LIV-13. Huatuojiaji points associated with attachments of the splenius cervicis and rhomboids (usually T2-T3 are reactive). Bailao (the motor point of splenius cervicis) and splenius capitis motor point (close to GB-20), both on the same sides as GB-26. BL-62 and contralateral SI-3 (SI-3 on the side of cervical pain). This combination addresses the Yang Qiao and its paired Du mai. The Yang Qiao involves the coordinated interaction between the Urinary Bladder, Gallbladder and Stomach sinew channels. 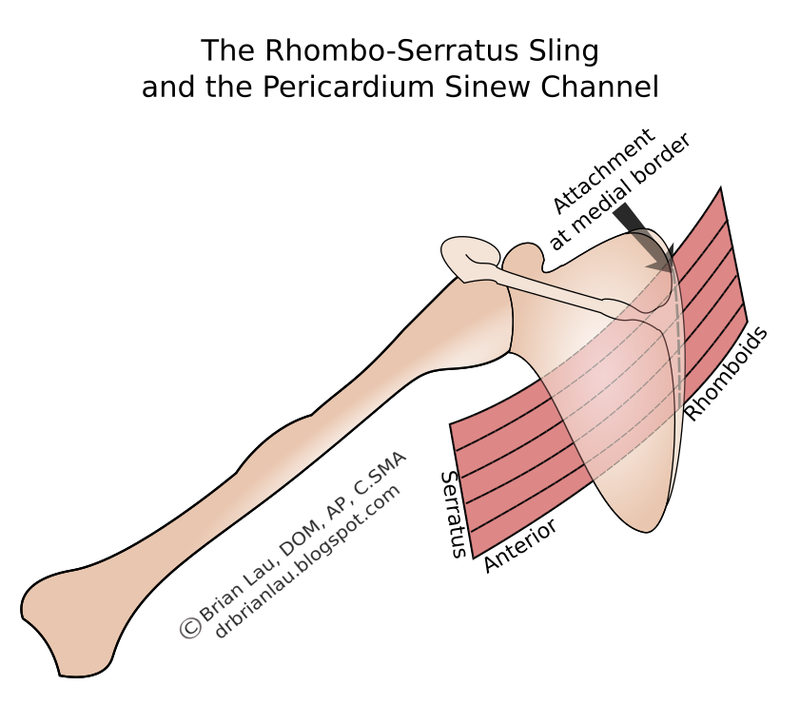 GB-41 and contralateral SJ-5 (SJ-5 on the side of the short rhombo-serratus sling). 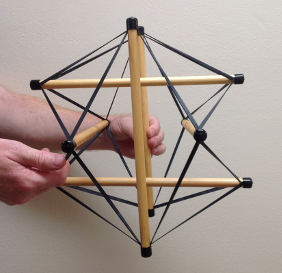 GB-41 and SJ-5 address rotational aspects of the pattern. LIV-5, Adductor longus motor point, Quadratus lumborum motor point (on the side of the elevated ilium). This combination addresses the deeper underlying core imbalance. This shortness in the Liver sinew channel on one side will often cause deeper rotations which will result in counter-rotations mediated by the SPL. Below is a link for an article I wrote which will be featured in the Spring edition of the Illinois Association of Acupuncture and Oriental Medicine newsletter. It is currently posted on the Sports Medicine Acupuncture webpage. In addition to the link, I am including the full article below. This article will explore vertebral fixations and their relationships to both extraordinary vessels (Qi Jing Ba Mai) and the sinew channels (Jingjin). In Sports Medicine Acupuncture®, assessment of vertebral fixations is an important part of overall assessment and treatment when working with sports injuries and orthopedic conditions. Extraordinary vessel (EV) point pairs are used in conjunction with local needling at the M-BW-35 (Huatuojiaji) points, and with mobilization techniques, to free restrictions preventing proper vertebral movement. The Huatuojiaji needle technique and the mobilization are used to balance asymmetrical locking of the facet joints, where one side is locked in a closed position in relation to the other side. The EV point pairs regulate specific global strain patterns that stress the spine in specific regions. These strain patterns will be the focus of this article. Vertebral fixations are assessed by motion tests and by manual muscle tests. Vertebral fixations at specific regions of the spine will cause bilateral weakness of specific muscles when testing with manual muscle tests.1 Interestingly, the muscles that become bilaterally weak are not innervated by the spinal nerves at the level of fixation. 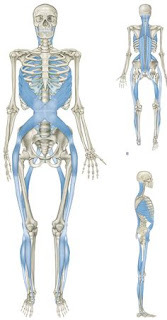 To gain insight into this phenomenon, it is useful to look at the sinew channels, note their connection to the spine, and understand how they can exert a negative influence on these spinal segments when dysfunction exists. Bilateral muscle weakness can then be seen through a channel relationship. The fascia which travels anterior to the rectus abdominis (that of the external obliques and part of the internal obliques) comprises the abdominal portion of the Stomach sinew channel while the posterior fascia comprises the abdominal portion of the Spleen sinew channel. This posterior abdominal fascia is continuous with the anterior portion of the diaphragm at the inner surface of the anterior ribcage.2,4 From here, one could follow the diaphragm around to its connection to the lumbar spine. 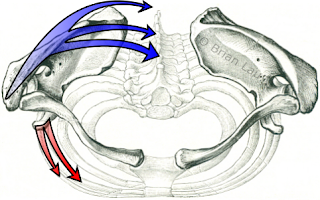 This connection, called the crus of the diaphragm, attaches to the lumbar spine at L1 and L2.3 Restriction in this portion of the Spleen sinew channel can contribute to fixations at the T11-L2 vertebral levels. One could also follow the diaphragm up to the central tendon. The pericardium attaches to the central tendon on its superior surface, and is in the same fascial layer which comprises the hyoid muscles.2 This plane (posterior abdominal fascia-diaphragm-pericardium-hyoids) could be considered part of the sphere of influence described by the Penetrating Vessel. For all practical purposes, the Spleen sinew channel can be seen to follow this upward trajectory also. This portion of the channel can contribute to fixations from T3-T9. When the Spleen sinew channel does not have adequate length, the abdomen becomes bowed and distended and the chest is depressed. 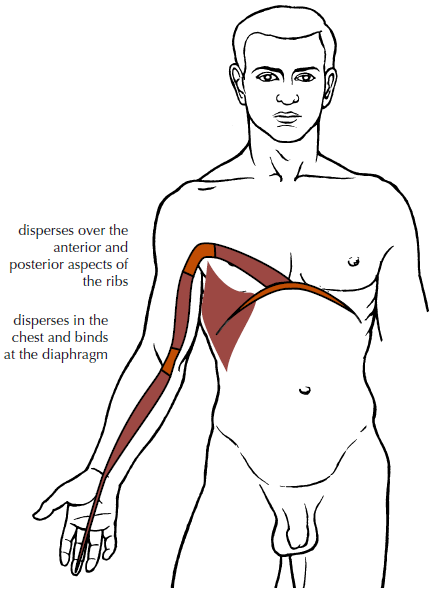 This adds tension to the thoracic region and contributes to fixations in this region. Vertebral fixations of these regions cause bilateral weakness of muscles that are part of the Urinary Bladder (Pangguang) sinew channel. 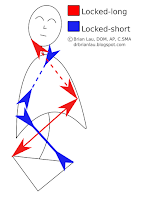 These include the lower trapezius (for fixations of T11-L2), the teres major (for fixations of T3-T9), and the gluteus maximus (for fixations of C1-C3, which are not discussed in this article).1 This can be understood as a five element relationship involving the Earth and Water elements. These channels create a dynamic balance, as the Spleen and Stomach sinew channels consist of flexors of the legs and torso and converge at the abdominal aponeurosis while the Urinary Bladder sinew channel consists of extensors of the legs and torso and converges at the thoracolumbar aponeurosis, when looking at fascial connections, at least.2,4 When vertebral fixations are present, SP-4 (Gongsun) and P-6 (Neiguan) are added to the treatment. The Kidney (Shen) sinew channel includes the adductor magnus and the semimembranosus muscles. These structures link with the pelvic floor muscles which are then continuous with the anterior longitudinal ligament,2,5 which travels up the anterior portion of the spine. The psoas major attaches to the lumbar transverse processes, the vertebral bodies, and even the intervertebral discs of the lumbar vertebrae.2,3 The psoas is more in a direct line with the Liver sinew channel, but since it attaches to the vertebral bodies and intervertebral discs and therefore links with the anterior longitudinal ligament, it also converges with the Kidney sinew channel. When the psoas does not have adequate length, there is excessive lumbar lordosis and lack of freedom in the lumbar spine. This contributes to vertebral fixations of lumbar vertebrae. Vertebral fixations of the lumbar vertebrae cause bilateral weakness of neck extensors.1 This can best be understood through the relationship of the Yin Motility Vessel (Yin Qiao) and Yang Motility Vessel (Yang Qiao). As one becomes short and tight, the other becomes flaccid. This is traditionally discussed in the context of their relationship to the muscles of the legs, but the relationship can continue throughout the entire channel.6 When vertebral fixations are present, KID-6 (Zhaohai) and LU-7 (Lieque) are added to the treatment. The Urinary Bladder (Pangguang) sinew channel traverses the posterior portion of the body and includes the muscles of the calves, the hamstrings, the sacral fascia, the erector spinae muscle group, and the suboccipital muscles which binds this channel to the occiput.5,7 These suboccipital muscles control the fine movements of the atlanto-occipital joints, and can contribute to fixations at this region. When the suboccipital muscles do not have adequate length, there is capital extension and restriction in movement at the atlanto-occipital joint. This contributes to fixations of the occiput and C1. Vertebral fixations of the occiput and C1 cause bilateral weakness of the psoas major.1 Again, this can be understood via the relationship of the Yin Motility Vessel and Yang Motility Vessel. When vertebral fixations are present, BL-62 (Shenmai) and SI-3 (Houxi) are added to the treatment. Note: Vertebral fixations at C4-C6 and sacroiliac fixations, all treated with GB-41 (Zulinqi) and SJ-5 (Waiguan), are not discussed in this article. Also not discussed are fixations at C7-T2, which are treated with KID-6 (Zhaohai) and LU-7 (Lieque). These are left out to avoid excessively lengthy discussion. 1. Walther, David S. Applied Kinesiology: Synopsis. Pueblo, CO: Systems DC, 1988. Print. 2. Myers, Thomas W. Anatomy Trains: Myofascial Meridians for Manual and Movement Therapists. 3rd ed. Edinburgh: Churchill Livingstone, 2014. Print. 3. Netter, Frank H. Atlas of Human Anatomy. 6th ed. Philadelphia, PA: Saunders Elsevier, 2014. Print. 4. Stecco, Carla, and Warren I. Hammer. Functional Atlas of the Human Fascial System. Edinburgh: Elsevier, 2015. Print. 5. Legge, David, and Karen Vance. Jingjin: Acupuncture Treatment of the Muscular System Using the Meridian Sinews. Sydney: Sydney College, 2010. Print. 6. Wang, Ju-Yi, and Jason D. Robertson. Applied Channel Theory in Chinese Medicine: Wang Ju-Yi's Lectures on Channel Therapeutics. Seattle: Eastland, 2008. Print. 7. Wilke, Jan, Frieder Krause, Lutz Vogt, and Winfried Banzer. "What Is Evidence-Based About Myofascial Chains: A Systematic Review." Archives of Physical Medicine and Rehabilitation (2015). Web.